The Dark Side of the Moon, easily one of the best rock albums of all time, has returned to the Billboard Top 200 charts at #13, marking its 889th week on that chart. It joins the band's curtain call, The Endless River, which released at #3 on the same chart and now sits at #33. Dark Side also holds the record for most consecutive weeks on that chart, an indicator of the band's lasting impact and popularity. WhyHunger, a 501(c)(3) charity organization, is auctioning off a drumhead signed by none other than Nick Mason as part of their annual Hungerthon drive. The auction ends tomorrow and, as of this writing, sits at US$1000. In their own words, WhyHunger is a leader in the fight to end hunger and poverty, by connecting people to nutritious, affordable food and by investing in grassroots solutions that inspire self-reliance and community empowerment. On an important note this time of year when there are so many deserving charity options, they're also highly rated for managing their finances and for accountability and transparency, so even if you can't bid, please spread the word on this worthy cause and help a fellow Floyd fan get a great Christmas present in the process! As all of our readers no doubt know, The Endless River, which is essentially guaranteed to be the last studio release from Pink Floyd, has by now been released globally (and of course can be ordered at the link above or via the sidebar). As one would expect for a release from such an important and legendary band that until a few months ago seemed unthinkable, there's a ton of news out there. Rolling Stone spoke to David Gilmour about why he thinks this is truly the end for Pink Floyd, what's on the horizon for him, and whether there was ever any real chance of Roger Waters appearing on the record. Meanwhile, Nick Mason speculates to Billboard about the possibilities of more remixes/remasters (including Animals), additional unreleased material that might accompany such re-releases, and video coming up in support of The Endless River (not to mention years of archived video). In The Studio's Redbeard also spoke to Gilmour and Mason, in an audio interview aboard David's floating studio on the Thames, about the genesis of the album. Obviously there's plenty more to come, so should you find anything particularly notable, please feel free to contact me using the email link above. Finally, we leave you with the newly-released promo video for "Louder Than Words", the closing song of The Endless River and, for all practical purposes, Pink Floyd. Several singles, for lack of a better term, have been released by Roger since his last official studio album, Amused To Death (1992), and Roger has been candid about the fact that he was working on a project tentatively titled "Homeland". That's all relatively old news now, since he then embarked on a monumental world tour of The Wall, playing just about every corner of the earth over the course of three-plus years. 219 shows later, Roger finally had the time to complete this new record. Will any of those aforementioned 'singles' be included on this new studio album, whatever it ends up being called? Roger isn't saying much, but has hinted that like his most successful albums, this new piece will have a central theme. "It's about an old man and a young child trying to figure out why they are killing the children", he recently stated to Rolling Stone magazine. A new song, "If I Had Been God", was performed at the Russell Tribunal (also known as the International War Crimes Tribunal) recently. This performance consists of Mr. Waters playing an acoustic guitar by himself while singing the lyrics of the song. It certainly sounds like it could fit in with the expected concept of his eagerly anticipated album. We hope you enjoy it! Pink Floyd's official site has begun the promotional push for the impending release of the band's new album, The Endless River, on their website. Included are the first sample of music from the album, a video teaser/commercial, a track listing (below), and artwork/detail for the standard, double vinyl, and deluxe box editions. Expect more tidbits as the November release date approaches. 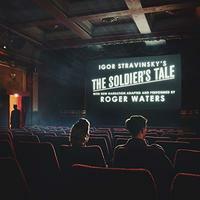 A documentary covering Roger Waters's The Wall tour will be premiering at the Toronto Film Festival in September. Those who attended any of the 2010-2013 concerts may have suspected something was in the works, as cameras were present and obvious at the shows, but it will still be a treat to relive what those great shows. A musical legend in her own right, Marianne Faithfull's newly-released single, Sparrows Will Sing, was written by none other than Roger Waters. While not directly related to the Floyd, we imagine that there are readers here interested in anything written by any of the members of the band, past or present. Those interested in hearing the performance from her forthcoming album, Give My Love To London, can do so at the official YouTube link. As reported in several places, a source has revealed to The Sun that the upcoming new album The Endless River will be "spacey" and may not be what fans are expecting. It's noted that fans should expect long instrumental jams—and the source may have implied that only one song will have vocals (or at least vocals by David Gilmour). Also confirmed, again, is that there will unfortunately be no tour; by all appearances, this truly is the band's swan song. Confirmation of "The Endless River"
Via The Associated Press, Pink Floyd spokesman Doug Wright has confirmed the October release of The Endless River, containing "mainly ambient and instrumental music" from the The Division Bell sessions. Wright also confirms that Roger Waters is not involved.